The idea for iHorror came when we were writing the iHero series. We rang our editor up and told him what we wanted to do. He loved the concept and told us to get on with it! We’ve enjoyed writing the gory bits – it’s so different from our normal style of comedy writing! This series is designed for people who want to kill vampires and supernatural nasties, rather than fall in love with them! You are the Hunter, protecting the world of humans from supernatural horrors in all their forms. Vampires, werewolves, demons, zombies – you have fought all these creatures and more, and you’ve always beaten them… so far. Will you be able to fight the creatures of the dark and survive? There are four books to scare you! Not only are the stories frightening to read, we think they look brilliant and so do other people! 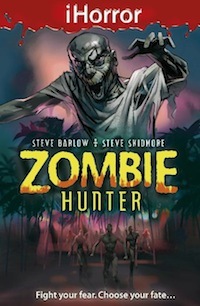 They have been described as “Fun gore-packed adventure books!”. You are The Hunter – destined to fight horror wherever you find it. Load your weapons. Prime your senses. It’s time! Fight your fear and choose your fate as you battle the undead in this power-packed iHorror adventure. You’re called to an island in the South Pacific – home to the Nutco Oil corporation. Their operation is being disrupted by the sort of pest that only you can help to defeat – zombies! They are threatening to destroy everything on the island of Saruba. You are The Hunter – destined to fight horror wherever you find it. The island of Okinawa in Japan is rocked by a massive earthquake – opening a firey portal to the underworld! 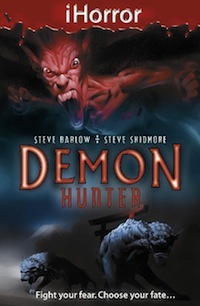 Terrible demons flood through, bent on tormenting humankind and making Earth a living nightmare. Only you can stand up to these unearthly horrors. Only you can send them back to the depths where they belong. 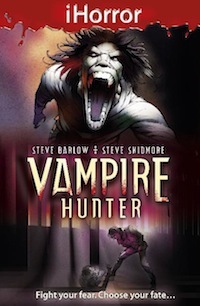 You are The Hunter – destined to fight horror wherever you find it. A full moon hangs high in the sky, casting an evil glow. Werewolves are on the prowl for flesh, gathering in numbers and strength. You must track these inhuman creatures across North America to fight face-to-face with the pack leader before time runs out and the Great Hunt begins. Go now! 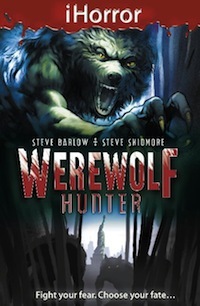 Stop the rampage of the werewolves in its tracks.